ABC7 is partnering with the Red Cross to support life-saving disaster relief for those affected by wildfires across the West Coast, like our neighbors impacted by the Valley Fire and the Butte Fire. It's easy to Give Where You Live -- to make a $10 donation, just text the word "Red Cross" to 90999. Evacuees can register on the American Red Cross "Safe and Well" website or call 1-800-RED-CROSS (1-800-733-2767) to let their families know they're safe. If you choose to donate online, they say that money can only be designated for disaster relief or your local Red Cross chapter. The County of Lake Office of Emergency Services asks that people who want to help consider making monetary donations through the North Coast Opportunities/Mendo-Lake Credit Union or Lake County Wildfire Relief Fund. List of donation centers (nonprofits, businesses and individuals) who are dedicated to helping the Lake County fire relief effort. LoveLakeCounty.org is an online hub where people can quickly connect with local opportunities to donate, volunteer, and give to the victims of the recent Northern California fires. The site is being updated live, and will remain updated as long as it takes. 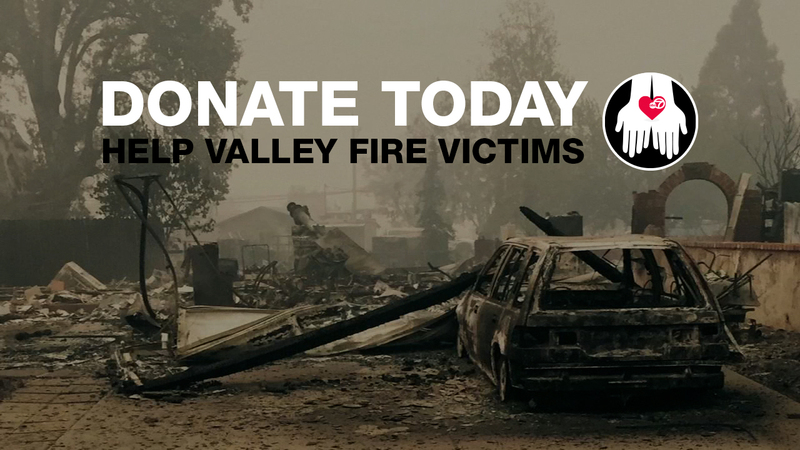 100% of the money collected will be given directly to the firefighters. In addition the Forestry Crabfeed, which was established as a benevolent fund to assist the employees in the Sonoma Lake Napa Unit, is a non-profit 501c3 so your donation is tax deductible, tax payer ID 45-3748304. San Francisco firefighters are looking for monetary donations to give toys to the children who we impacted by the fire. Gott's Roadside Cafes will be donating 50% of profits to Valley Fire victims on Thursday, October 1, 2015.